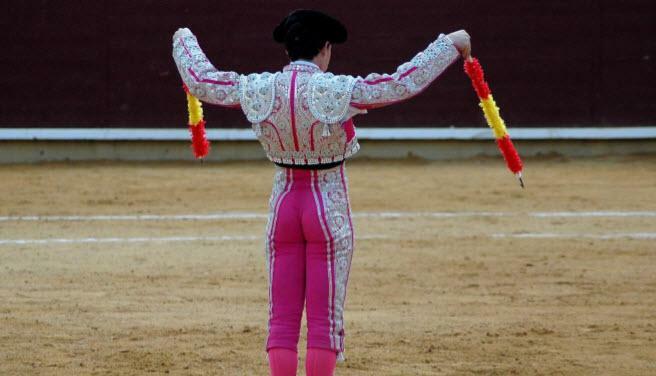 SocGen: "We Are Not Buyers Of US Equities"
"Bulls beware!" is the ominous big picture headline from Societe Generale's latest Equity Strategy report. Simply put, Roland Kaloyan explains that investors are facing "a tired bull market"
We started our 2018 equity outlook by highlighting our concern about the volatility regime given the amount of short volatility positions in the market. Looking forward, a higher volatility regime and tighter central banks should prevent US and European equity markets from extending this nine-year-old bull market much further. Expect the US earnings momentum to fade soon now that the tax reform impact is almost fully taken into account by analysts (2018 EPS growth: +19%). Escalating protectionist measures are a growing tail risk for us. The US midterm election in November will probably be another source of stress for equity markets, potentially pushing the S&P 500 back down to its fair value at 2500. Back in November when we rolled out our 2018 equity outlook we raised clear concerns regarding the positioning of volatility, which we identified as one of the major risks for a short-term correction facing US equities. Indeed, short positioning on VIX was extreme into the current correction. Unwinding proved particularly painful last month, with VIX rising by up to 50% intraday, a level not seen since 2015, and then only briefly, and before that 2009. This marked a turning point in the equity volatility regime for SG Equity derivatives strategists . If the VIX is back between 15% and 20%, intraday volatility remains very high, highlighting a lot of nervousness in the market. Will the credit market be next to fall? The VIX and the credit market (US High yield spread) have been strongly correlated in the past. Now volatility has spiked; is credit the next to fall? Not just yet, reply our credit strategists. Since the start of year, they have been expecting more challenging conditions to appear only in the second half of the year, with the end of the EU’s Corporate Sector Purchase Programme (CSPP) and rising government yields. And now we have to add the possibility of a trade war. After the volatility, are we likely to see some tension in the credit market? Probably not until in the second part of the year, say our credit strategists. Until lately, it seemed like markets were only putting stock in positive announcements (tax cuts), while brushing off the bad ones (Korea, the wall). With protectionism, the mood is changing. Markets like to split President Trump’s economic programme into two parts. There is the programme that supports equities, and this includes tax reforms and deregulation. And there is the programme that seems to create stress in the financial markets, and this includes a more restrictive trade policy. Among the various trade measures that the US administration can apply, only some are dependent on presidential power. The newspapers have never talked so much about tariffs in the US as they have in the last 18 months. Article 232 is being used to raise tariffs on steel and aluminium by 25% and 10%, respectively, from all countries that are a concern for national security. 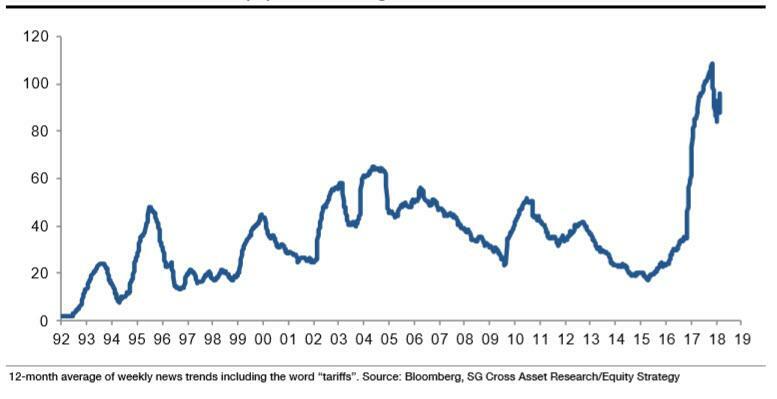 We have, in coordination with SG analysts, drawn up a list of global stocks likely to benefit (SG Global Long Basket: seven names) or suffer (SG Global Short Basket: 13 names) from higher tariffs. US steel producers will naturally benefit from this measure, Asian steel companies as well as US steel consumers (like automakers and homebuilders) would be penalised. Below we present a comparison between the current bull market and the previous one. Between 2004 and 2008, US earnings grew faster than sales (i.e. rising corporate margin) and equity prices (i.e. P/E contraction: from 23x to 17x). Since 2011, corporate margins have remained roughly stable, earnings have grown by ~50%, while the equity market has doubled. This bull market has been mainly driven by P/E expansion (trailing P/E up from 17x to 24x). What is driving the P/E ratio in a bull market? The first intuition is earnings growth outlook. Accelerating earnings growth would rationally deserve high multiples. However, the chart below shows that earnings growth has systematically disappointed the start-of-year expectations every year since 2012. A second driver of P/E could be risk-free rates. Indeed, an overly low risk-free rate (for example when the Fed fund rate is below the core inflation level) would push companies to make more buybacks and investors to take more risk. Between 2003 and 2008, the real Fed funds rate increased significantly, while since 2009 it has been negative. In our scenario three rate hikes this year, it would move back into positive territory and thus put pressure on US equity multiples. Our equity risk premium model compares the long-term expected return on equities (as measured by the internal rate of return of equities) relative to long-term bond yields. The US equity risk premium currently stands at 2.7% which is one standard deviation below the longterm average (3.9%). 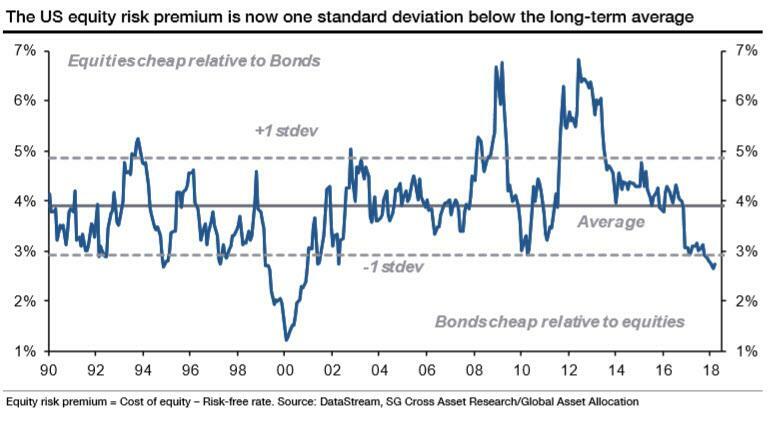 We have actually seen a lower equity risk premium in the past, but only during the dotcom bubble. Hence, it would be difficult for US equities to absorb a much higher US Treasury yield. This is confirmed by the recent market swings. In the table below, we provide a sensitivity analysis of the US equity market to the equity risk premium and long-term bond yield. A 3% rise in the US treasury yield would theoretically push the S&P500 up to 2500pt. In a US economy growing at 3%, any historical regression shows that earnings tend to grow at ~10% per year. According to our calculations done at the index level, the US tax reform would boost 2018 earnings by a maximum of 10%. Taking into account further tailwinds (rising oil prices and weakening USD), US EPS should grow by around 20% this year. US 2018 earnings growth is now well above 2017 and 2019 earnings growth: this is atypical of a tax reform impact. According to IBES, consensus analysts have revised up their 2018 US earnings estimates for all sectors since the beginning of the year. US 2018 earnings growth is now expected at 19.3%, so the impact of the tax reform has been taken into account almost fully. Additional evidence that this is the consequence of US tax reforms is the differential between EPS adjustments and EBITDA adjustments: for each US sector, 2018 EPS has been revised higher than 2018 EBITDA. Meanwhile, for both 2019 and 2020, the consensus has S&P 500 earnings growth at 10%. US earnings growth should thus run out of steam soon. On 6 November, midterm elections will take place in the US. Control of both chambers of Congress is up for grabs: the Senate might be a tough hurdle for the Democrats, but they have a chance of gaining control of the House. According to Gallup polling, since 1946, when presidents have an approval rating of above 50%, their party loses an average of 14 seats in the House midterm elections, compared with an average loss of 36 seats when they are below 50% (the Democrats need 24 new seats to take control of the House). President Trump’s approval rating is currently at 39%. If either house of Congress flips, the US would be likely to encounter more political gridlocks. The Republican legislative agenda would be under pressure if not dead and no one could then exclude further investigations into the Trump administration. This could be new source of volatility for US equities, with both valuations and expectations at decade highs. While US large caps would probably be protected by a weaker USD in such a scenario, the Russell 2000 (small & mid caps, more domestic, weaker balance sheet) would be more at risk. So, apart from fading earnings momentum, higher volatility, midterm election uncertainty, credit risk anxiety, and rising rates... everything's Goldilocks for stocks, right?